In most homes garage is the most disorganized place with tools and other assorted items scattered all over the place. It is important that one should pay a lot of attention to stack tools, consumables and other articles properly so that whenever they are needed they can be easily located. 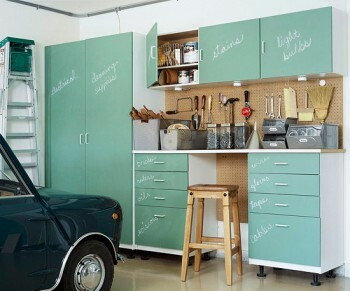 One can begin organizing the garage with a ‘Utility Storage Cabinet’. This is a 30 inch wide, 20 ¼ inch deep and 36 3/8 inch high cupboard comprising two adjustable shelves at the back of securely latching doors. This cupboard can store up to 75 pounds per shelf. One can keep in the cabinet fluids such as oils and coolants or garden tools, nails, screws or many other articles. The height of the utility storage base cabinet is ideal to provide enough working space or extra storage space to place some more items. The cabinet made of resin and light brown in color is easy to clean and the blue handles on the door make the cabinet quite attractive. The cabinets are normally sold in completely knock down (CKD) sets and are easy to assemble without the need for any tools. The tall Utility Cabinet can store even more number of items than the utility storage cabinet on its four adjustable shelves. The shelves inside this 72 3/8 inch high cabinet can also stock up to 75 pounds. It is also a simple job to assemble without the need for any tools and can be utilized straightaway for setting right the garage. The shelves can be used for keeping all the tools and other items required for the car or if there is enough space, fertilizers, pesticides and garden tools can also be stored on the strong shelves of this cabinet. One will be pleasantly surprised to see how tidy the garage appears after storing all the tools, tackles and consumables in the cabinet. If the garage still looks disorderly because of garden tools, it is better to think of mounting a Tool Hanger Kit on one of the garage walls. This sturdy hanger kit consists of one plank of wall strip that is mounted to the wall, two 8-inch D-Hooks and one J-Hook for hanging rakes, shovels, brooms and many more items. The tool hanger kit, with its grey and black merges easily in to the garage inconspicuously and will appear more orderly than simple hooks screwed into the studs at the back of walls. All the yard tools will no longer be on the floor and can be easily located when stored on this useful hanger. In course of time, if the assortment of tools has increased and the wall space in the garage is not sufficient, the Tool Rack with wheels will come in handy. This rack can keep over 30 tools in ‘side access’ slots that are equipped with clips to secure the tools. The tool rack made of steel is strong and can be assembled quickly without using any tools. The items also can be placed on the rack easily. The four caster wheels will facilitate easy movement of the rack and therefore, rakes, brooms, shovels and other tools will be in the proper place for easy access whenever required. Its light brown color gives a clean and attractive look. The garage also appears clean and well-organized. In spite of a systematic layout of the garage with cabinets or a workbench, if tools or any other items needed cannot be easily located, it is advisable to mount a Workbench Kit on the wall. This piece consists of a wall strip of 48 inches wide and six inches high and is provided with a screwdriver holder, a small tool rack, a basket and two resin bins. This unit is useful for keeping small tools like screwdrivers, hammers or pliers on the tool rack. The basket is useful to keep glues or aerosol paint cans, where as the bins are ideal for storing nails or screws. ‘Free Standing Garage Shelves’ affords still one more choice for storing tools and other articles in the garage. One can store those items that are readily visible to the user so that he can take them out for use whenever needed. No tools are required to install this set of shelves. The four shelves sit in a frame of 64 inches high and 35 inches wide, offering all the space required for keeping buckets, boxes or bags of consumables within easy access. These cabinets, racks, shelves and a workbench kit are some of the useful items to help properly organize the garage and reduce the untidiness to bare minimum.